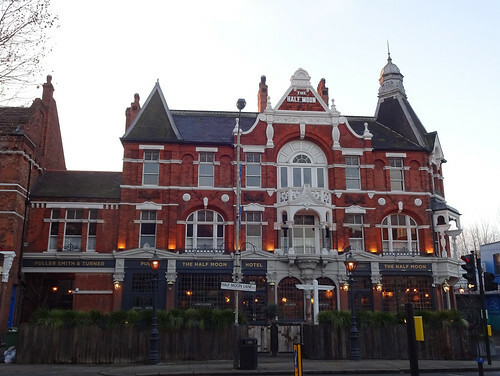 Our featured article is the Half Moon in Herne Hill. After a three and a half year closure due to flooding, it was reopened last March. The live music venue has gone and the pub now also acts as a hotel, bar and kitchen. Why not stop by for breakfast, though maybe skip the continental buffet. A new article has gone up for Horn of Africa, twixt Brockley and New Cross. The menu on offer appears to vary on the day - who doesn't love a surprise? Updates have been made to the Victoria Inn in Peckham. Expect a bit of work with your bacon roll here. Tricky with the Victoria Inn. Being Awkward I would insist on ordering at the bar or walk away (I do not recommend this policy, but I would); at £6 for a bacon roll one should damn well be able to telegraph the message from across the street. At least you got a plate. I was too tired to argue; I was most of the way through a railway line walk at that point, and walking is exhausting at the moment. I wasn't criticising; I am too Awkward for my own good sometimes. It's good against confidence scams, but I do go hungry and thirsty out of pique sometimes. I did walk out of a pub yesterday because all the ground-floor seating was stools too high for me to sit on.